Enjoy sweet dreams in your very own Personalized Women's Sleepwear. You and your true love are sure to feel comfy and cozy cuddling up together for a good night sleep. Whether you know someone just married, expecting a child or enjoying a good nights sleep, GiftsForYouNow.com has Custom Printed Sleepwear made just for her. 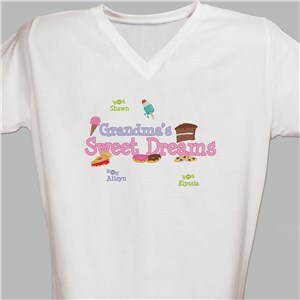 Most of our Women's Sleepwear can be personalized to display any name or special title plus many can be customized with all of the children, grandchildren and great grandchildren names. Our custom sleepwear is sure to bring sweet dreams year round. 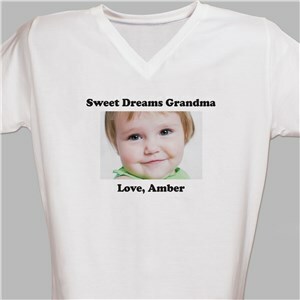 Our Personalized Women's Sleepwear is available on our 100% combed ringspun cotton jersey v-neck personalized nightshirt, machine washable in sizes S/M or L/XL. Wear it to the pool, over jeans or to bed. Includes FREE Personalization! Also included in our collection of Personalized Sleepwear are Personalized Ladies Shorts. Perfect for just lounging around the house or romantic evenings with your true love. Personalized Women's Sleepwear from GiftsForYouNow.com includes FREE personalization with every order! Enjoy the comfortable fit and quality our sleepwear can bring at an affordable price. Make it a perfect gift filled with love for any occasion.